It’s homeschool convention season! It’s one of my favorite times of the year. This is when I dream and plan about the next homeschool year. I create impressive (and totally unrealistic) educational plans. I mean, the sky really is the limit here. I daydream about fitting in two or three Latin programs while juggling four math programs and trying two history programs. It is total craziness! But everything looks so amazing and I just want to do it all!! By September, I’ve come crashing back to earth and have had to simplify. But, whatever. For now, I can enjoy dreaming about the perfect curriculum (which I’ve already found), and I can peruse the curriculum catalogs and await the UPS deliveries. If you’re also trying to plan for a new year and you’re agonizing about choosing curriculum, I have a few tips for you. There are lots of wonderful resources out there, but you probably can’t afford them all (and you don’t really need all of them either). So, you have to prioritize when you are picking your curriculum for each year. I choose to spend the largest portion of my budget on reading and math. Next in line is Bible, followed by my language arts subjects like writing, spelling, and grammar. Then I choose history and science and then logic, foreign languages, and the arts. Pick your most important subjects first and then fill in with all the others. Do you know how you enjoy teaching? Before you start shopping, take some time to think about the things you enjoy and the way you prefer to teach. Do you prefer teaching with projects, books, textbooks, videos, or online learning classes? Would you rather have a program that’s open and go and prepared for you or would you rather pull all the resources together and forge a new learning journey? The best curriculum is one that gets done at your house, and if it doesn’t work for you as the teacher then it won’t be used on a daily basis. So, consider your needs and preferences when you choose curriculum. Now that you’ve considered your teaching style, think about the ways that your children learn best and look for curriculum that will be a good fit for them. Do your kids learn best by doing, listening, reading, or watching something? Find a program that will teach to their learning style. And let me share an extra little secret for success: Many programs have components that cater to multiple learning styles. So find one that can be easily adapted to work for your children, because a varied learning environment is best anyway. Once you’ve written out all your plans and made a giant list of the curriculum that you would like to use in your school year, take a step back and evaluate. Ok, I’m preaching to myself here because I love all the shiny new curriculum. Did you know that you can overload your children and your schedule with all of those resources? You might need to think about simplifying your plan before you start purchasing. Focus on creating a love of learning by not overloading your family with too many curricula and a long daily checklist of work to be completed. Before you press the buy button or hand over your cash, think about your time. Write out a rough draft of your ideal homeschool schedule and see how the various subjects fit into your day. You might find that there’s not quite enough time to fit everything in for that year. I have a question that I ask myself before I make final curriculum plans and definitely before I make a purchase: Is this realistic and doable? No matter how wonderful a curriculum looks or sounds, if I know that it’s not realistic to cram into my school day I know that I need to find something else or try to cut back in another area. You’ve considered your child’s learning styles, but have you asked them what topics most interest them? You might be surprised by the answers! I think it’s important to teach children to take charge of their education and learning at a young age. I do this by asking my kids for feedback on each homeschool year and then asking them what they would like to study in the upcoming years. Consider having a short time to sit with each child and brainstorm some fun ideas for the upcoming school year. Ask what science topics, famous people, or historical events they would be most interested in studying. Then use their answers to help direct your curriculum choices. I do this for myself more than for my kids! Each year I find something fun and new to add to our day. Sometimes it’s just a simple logic game or an interesting puzzle book for my kids to work on each day. Other times I find a completely different science or art curriculum and try something out of the ordinary. You can get bored with homeschooling and so can your kids. And while I don’t recommend jumping from one curriculum to the next every single year, it can be fun to find a fun new resource for each school year. This keeps your homeschool more exciting for both your kids and you as the teacher. Do you feel a little more confident about choosing curriculum for your homeschool? What are my priorities and goals this school year? In what subjects do my kids need to make the most improvement? How do I enjoy teaching and what type of resources do I find the most helpful? Where can I simplify or reprioritize? How much time do I want to spend on my homeschool day? Is my plan realistic and doable, fitting within my homeschool timeframe? What do my kids enjoy studying and how can I foster their love of learning? Is there something fun or different that I can introduce this year to add variety? 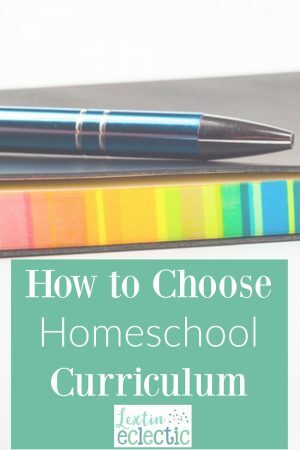 Choosing curriculum can be one of the most fun and exciting parts of homeschooling, but it can also be incredibly overwhelming. You want to make a good decision and use your budgeted dollars wisely. You want what’s best for your children and you hope to have a successful homeschool year, but it can be hard to know what resources to use. Yes, we’ve all been there! But you can enjoy choosing curriculum with confidence with a little help from the above questions! And even if you make a curriculum mistake (which will absolutely happen more than once), you can still recover from your mistake and make wiser choices in the future. So, grab your catalogs and start planning out your next homeschool year! Read all the posts in my curriculum series right here!